The parka is durable, lightweight and resists a wide range of contaminants, including DEET, petroleum and salt water. Perfect for temperatures ranging from -10 to 60 degrees F, it remains waterproof, windproof and breathable, keeping you warm, dry and ready for action. GORE-TEX® is ultralight, waterproof, windproof and highly breathable. It's waterproof, even after repeat launderings, exposure to DEET, oil, and other types of petroleum. Fade and shrink resistant. 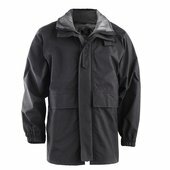 Has factory seam sealed for superior waterproof protection and insulation. 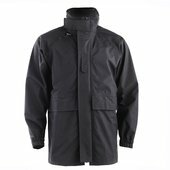 Has a roll and stow hood, two front cargo pockets with hook and loop closure, two hand-warmer pockets and internal chest pocket with hook and loop closure. It has a two-way zipper front with rain flaps. Extended drop tail for added rain protection. Badge tab secured with hook and loop closure. Drawstring adjustment for quick, secure fit and adjustable hook and loop closure at sleeve cuffs. The park should fit comfortably around the body and arms without restricting range of movement to include when wearing the fleece liner. The sleeve length should cover the wrist bone, but not extend past the lower thumb knuckle. The hood shall remain in the stored position unless being used during inclement weather. Do not dry clean. Machine wash, rinse thoroughly. Do not use fabric softener or bleach. Tumble dry on warm heat. The parka is approved optional outerwear that can be worn with the Service Dress Blue, Service Khaki and E1-E6 Service Uniform."